1. Treaty between Great Britain, Austria, France, Prussia and Russia, on the one part, and the Netherlands, on the other. In the Name of the Most Holy and Indivisible Trinity. His Majesty the King of the Netherlands, Grand Duke of Luxembourg, engages to cause to be immediately converted into a Treaty with His Majesty the King of the Belgians, the Articles annexed to the present Act, and agreed upon by common consent, under the auspices of the Courts of Great Britain, Austria, France, Prussia and Russia. Her Majesty the Queen of the United Kingdom of Great Britain and Ireland, His Majesty the Emperor of Austria, King of Hungary and Bohemia, His Majesty the King of the French, His Majesty the King of Prussia, and His Majesty the Emperor of all the Russias declare, that the Articles mentioned in the preceding Article, are considered as having the same force and validity as if they were textually inserted in the present Act, and that they are thus placed under the guarantee of their said Majesties. The union which has existed between Holland and Belgium, in virtue of the Treaty of Vienna, of the 31st of May, 1815, is acknowledged by His Majesty the King of the Netherlands, Grand Duke of Luxembourg, to be dissolved. The present Treaty shall be ratified, and the ratifications shall be exchanged at London at the expiration of six weeks, or sooner, if possible. The exchange of these ratifications shall take place at the same time as that of the ratifications of the Treaty between Holland and Belgium. In witness whereof, the respective Plenipotentiaries have signed the present Treaty, and have affixed thereto the seal of their Arms. Done at London, the nineteenth day of April, in the year of Our Lord one thousand eight hundred and thirty-nine. Annex to the Treaty signed at London, on the 19th of April, 1839, between Great Britain, Austria, France, Prussia and Russia, on the one part, and the Netherlands, on the Other. [FOOTNOTE: Of the Twenty-Four Articles annexed to the treaty only such parts are reproduced here, as are of particular interest for the present study. A summary of the contents of all the Twenty-Four Articles is given in the footnote of page 48.
such as they formed part of the United Kingdom of the Netherlands constituted in 1815, with the exception of those districts of the province of Limburg which are designated in Article IV. The Belgian territory shall, moreover, comprise that part of the Grand Duchy of Luxembourg which is specified in Article II. In the Grand Duchy of Luxembourg, the limits of the Belgian territory shall be such as will be hereinafter described, viz.. . . In execution of that part of Article I which relates to the province of Limburg, and in consequence of the cessions of His Majesty the King of the Netherlands, Grand Duke of Luxembourg, makes in Article II, his said Majesty shall possess. . . .
Belgium within the limits specified in Articles I, II and IV shall form an independent and perpetually neutral State. It shall be bound to observe such neutrality toward all other States. (A Treaty between Holland and Belgium comprising the 24 Articles above recited, together with the usual engagement for Peace and Friendship between the Parties, was also signed by the Plenipotentiaries of those two Powers on the 19th of April; and the ratifications were exchanged at the same time and place as those of the preceding Treaty.). 2. Treaty between Great Britain, Austria, France, Prussia and Russia, on the one part, and Belgium, on the other. Her Majesty the Queen of the United Kingdom of Great Britain and Ireland, His Majesty the Emperor of Austria, King of Hungary and Bohemia, His Majesty the King of the French, His Majesty the King of Prussia, and His Majesty the Emperor of All the Russias, declare, that the Article hereunto annexed, and forming the tenor of the Treaty concluded this day between His Majesty the King of the Belgians and His Majesty the King of Netherlands, Grand Duke of Luxembourg, are considered as having the same force and validity as if they were textually inserted in the present Act, and that they are thus placed under the Guarantee of their said Majesties. The Treaty of the 15th of November, 1831, between their Majesties the Queen of the United Kingdom of Great Britain and Ireland, the Emperor of Austria, King of Hungary and Bohemia, the King of the French, the King of Prussia, and the Emperor of All the Russias, and His Majesty the King of the Belgians, is declared not to be obligatory upon the High Contracting Parties. The present treaty shall be ratified, and the Ratifications shall be exchanged at London at the expiration of six weeks, or sooner if possible. This exchange shall take place the same time as that of the Ratifications of the Treaty between Belgium and Holland. Done at London, the 19th day of April, in the year of Our Lord, 1839. (L. S.) SYLVAIN VAN DE WEYER. Annex to the Treaty signed at London on the 19th of April, 1839, between Great Britain, Austria, France, Prussia and Russia, on the one part, and Belgium, on the other part. 3. Act of accession on the part of the Germanic Confederation to the territorial Arrangements concerning the Grand Duchy of Luxembourg contained in the first seven Articles of the Annex to the two preceding Treaties. The Plenipotentiaries of the Courts of Great Britain, Austria, Belgium, France, the Netherlands, Prussia and Russia, having this day, signed the Treaties concluded between the five Courts and His Majesty the King of the Netherlands, Grand Duke of Luxembourg, between their Majesties the King of the Belgians and the King of the Netherlands, Grand Duke of Luxembourg, and between the five Courts and His Majesty the King of the Belgians, the Plenipotentiaries have deemed it expedient that the Plenipotentiaries of Austria and Prussia, invested with Full Powers from the Diet of the Germanic Confederation, should be invited to accede in the name of the said Confederation, to the arrangements concerning the Grand Duchy of Luxembourg, which are contained in the Treaties above mentioned. In consequence, the Plenipotentiaries of Austria and Prussia, representing the Diet in virtue of the said Full Powers, declare that the Germanic Confederation formally accedes to the territorial arrangements concerning the Grand Duchy of Luxembourg, which are contained in Articles I, II, III, IV, V, VI and VII, of the Annex to the Treaties this day concluded between the five Courts and His Majesty the King of the Netherlands, Grand Duke of Luxembourg, and between the five Courts and His Majesty the King of the Belgians, as well as in the corresponding Articles of the Treaty signed at the same time between His Majesty the King of the Belgians and His Majesty the King of the Netherlands, Grand Duke of Luxembourg. And they take towards the Courts of Great Britain, Austria, Belgium, France, the Netherlands, Prussia and Russia, in the name of the Germanic Confederation, the engagement that the Confederation will entirely conform to the stipulations contained in the said Articles, which are hereinafter inserted word for word, so far as they concern the Germanic Confederation . The Plenipotentiaries of Great Britain, Belgium, France, the Netherlands, Prussia and Russia, in virtue of their Full Powers, formally accept, in the name of their respective Courts, the said Accession on the part of the Germanic Confederation. The present Act of Accession shall be ratified by the Courts of Great Britain, Austria, Belgium, France, the Netherlands, Prussia and Russia, and also by the Germanic Confederation, by means of a Decree of the Diet, of which the requisite number of copies shall be prepared. And the respective Acts of Ratification shall be exchanged at London at the expiration of six weeks from this date, or sooner if possible, and at the same time as the exchange of the Ratifications of the three Treaties above mentioned. In witness whereof the respective Plenipotentiaries have signed the present Act of Accession, and have affixed thereto the Seal of their Arms. His Majesty the King of Prussia having declared that, notwithstanding the hostilities in which the North German Confederation is engaged with France, it is his fixed determination to respect the neutrality of Belgium, so long as the same shall be respected by France, Her Majesty the Queen of the United Kingdom of Great Britain and Ireland on her part declares that, if during the said hostilities the armies of France should violate that neutrality, she will be prepared to co-operate with His Prussian Majesty for the defense of the same in such manner as may be mutually agreed upon, employing for that purpose her naval and military forces to insure its observance, and to maintain, in conjunction with His Prussian Majesty, then and thereafter, the independence and neutrality of Belgium. It is clearly understood that Her Majesty the Queen of the United Kingdom of Great Britain and Ireland does not engage herself by this Treaty to take part in any of the general operations of the war now carried on between the North German Confederation and France, beyond the limits of Belgium, as defined in the Treaty between Belgium and the Netherlands of April 19, 1839. His Majesty the King of Prussia agrees on his part, in the event provided for in the foregoing Article, to co-operate with Her Majesty the Queen of the United Kingdom of Great Britain and Ireland, employing his naval and military forces for the purpose aforesaid; and, the case arising, to concert with Her Majesty the measures which shall be taken, separately or in common, to secure the neutrality and independence of Belgium. This Treaty shall be binding on the High Contracting Parties during the continuance of the present war between the North German Confederation and France, and for twelve months after the ratification of any Treaty of Peace concluded between those Parties; and on the expiration of that time the independence and neutrality of Belgium will, so far as the High Contracting Parties are respectively concerned, continue to rest as heretofore on Article I of the Quintuple Treaty of the 19th of April, 1839. The present Treaty shall be ratified, and the ratifications shall be exchanged at London as soon as possible. In witness wherof the respective Plenipotentiaries have signed the same, and have affixed thereto the seal of their arms. Done at London, the 9th day of August, in the year of our Lord 1870. His Majesty the Emperor of the French having declared that, notwithstanding the hostilities in which France is now engaged with the North German Confederation and its Allies, it is his fixed determination to respect the neutrality of Belgium, so long as the same shall be respected by the North German Confederation and its Allies, Her Majesty the Queen of the United Kingdom of Great Britain and Ireland on her part declares that, if during the said hostilities the armies of the North German Confederation and its Allies should violate that neutrality, she will be prepared to co-operate with His Imperial Majesty for the defense of the same in such manner as may be mutually 'agreed upon, employing for that purpose her naval and military forces to insure its observance, and to maintain, in conjunction with His Imperial Majesty, then and thereafter, the independence and neutrality of Belgium. It is clearly understood that Her Majesty the Queen of the United Kingdom of Great Britain and Ireland does not engage herself by this Treaty to take part in any of the general operations of the war now carried on between France and the North German Confederation and its Allies, beyond the limits of Belgium, as defined in the Treaty between Belgium and the Netherlands of April 19, 1839. His Majesty the Emperor of the French agrees on his part, in the event provided for in the foregoing Article, to co-operate with Her Majesty the Queen of the United Kingdom of Great Britain and Ireland, employing his naval and military forces for the purpose aforesaid; and, the case arising, to concert with Her Majesty the measures which shall be taken, separately or in common, to secure the neutrality and independence of Belgium. This Treaty shall be binding on the High Contracting Parties during the continuance of the present war between France and the North German Confederation and its Allies, and for twelve months after the ratification of any Treaty of Peace concluded between those Parties; and on the expiration of that time the independence and neutrality Of Belgium will, so far as the High Contracting Parties are respectively concerned, continue to rest, as heretofore, on Article I of the Quintuple Treaty of the 19th of April, 1839. In witness whereof the respect[ive] Plenipotentiaries have signed the same, and have affixed thereto the seal of their arms. Done at London, the 11th day of August, in the year of our Lord, 1870. Fifth Army, consisting of the VII, XIV, XV and XVI army-corps, concentrates at Belfort. The First Army unites with the English and Belgian forces, and. after marching through Belgium, occupies Cologne and Coblenz, and opposes the German forces advancing from Northern Germany. The Second Army has to occupy Metz, and, after having accomplished this, turns towards Saarlouis and Coblenz, where it will join with the First Army. The Third Army penetrates Lorraine, occupies the northern part of the Vosges, and will then take up a position before Strassburg. The Fourth Army occupies the remainder of the Vosges and afterwards follows the advance of the other Armies as reserve reinforcement. The Fifth Army will storm Altkirch and Muehlhausen, and then remove towards Strassburg, which is to be taken, after which it joins the Third Army. "Gentlemen: We are, at present, in a state of legitimate defense and necessity knows no law! [FOOTNOTE: This translation does not render exactly the German original "Wir sind jetzt in Notwehr; und Not kennt kein Gebot!" but the English language hardly suggests any other rendering.] Our troops have occupied Luxembourg; perhaps they have entered already Belgian territory. Gentlemen, this is contrary to the rules of international law. It is true that the French Government has declared at Brussels that it would respect Belgium's neutrality as long as the adversary would respect it. However, we knew that France was ready for an invasion. France could afford to wait, but we could not! A French invasion at our flank, at the Lower Rhine, could have become fatal to us. Thus, we were forced to disregard the justified protests of the Governments of Luxembourg and Belgium. The wrong---I speak openly---the wrong which thereby we commit, we shall try to make good as soon as our military aim is attained. Whoever is threatened as we are, is not allowed to have any other consideration beyond that how he will hack his way through!" a. The original cover, in which the report of General Ducarne was found. b.The report of General Ducarne to the Belgian Minister of War, concerning his military conversations with the British Lieutenant-Colonel Barnardiston. c. The Minutes of the military conversations between General Jungbluth and the British Lieutenant-Colonel Bridges. Further proofs have been found that England, in cooperation with Belgium, had prepared the war against Germany already during peace time to the utmost, not only in a diplomatic but also in a military way. Recently, our troops seized some secret military guide-books about Belgium, edited by the British General Army Staff, entitled: "Belgium, Road and River Reports, prepared by the General Staff, War Office." We are in possession of four volumes of this handbook, of which volume I was printed in 1912, volume 2 in 1913, volume 3 (in two parts) and volume 4 in 1914. They show the following imprint: "Confidential. This book is the property of the British Government and is to be used for the personal information of . . . . . . . who himself is responsible for the safe keeping of the book. The contents are to be revealed to authorized persons only." The handbook contains evidences of military investigations in the minutest and most exact descriptions of the territory. The introduction reads as follows: "These reports can give only the condition of the roads at the time in which they were investigated. It will always be advisable to investigate them again before they are used, in order to make sure that they are not closed on account of repairs, pipe laying," etc. Thus, for instance, in volume 1, page 130 and following, the great highroad, Nieuport-Dixmude-Ypres-Menin-Tourcoing-Tournai, is described and accompanied by maps, with special regard to quality of the roads, the surrounding country, tactic considerations, observation posts and water conditions. In this discussion all the villages along the highroad are enumerated and described. Thus we find their exact distance from one another, detailed descriptions of the road net, with reference to elevations, bridges, crossings, telephone and telegraph stations, railway stations, including length of platforms and landing places; branch lines, oil tanks, etc. It is always mentioned whether the population speaks partly or altogether French. It will be difficult to take Dixmude from the north or from the south. The best position for defense against attacks from the south would be the railway embankment in the west as far as the street, to the east a number of small bills. As far as 1,500 yards west of the street the field is favorable for firing; farther to the east the view is obstructed by trees. Two battalions would be sufficient for occupation. The hostile artillery probably would be situated near Hoogmolen and Vertkant; otherwise there is nothing of tactical importance, nor is there anything which might retard marching. Point of observation, the mill of Reencheek permitting of a free panoramic view; also the Koelberg, seven and one-half miles distant from Ypres, with outlook toward the east and south. It may be mentioned that the church towers are usually mentioned as good observation points. In a similar detailed manner the entire course of the Scheldt, with all tributaries, villages, landings, opportunities for crossing, widths and depths, bridges, supply of boats, etc., is described. First---A schedule containing information about communities and villages for purposes of billeting; furthermore, instructions regarding transportation and all other items which may be needed by the local commander. Second---A number of important hints to aviators for that part of Belgium which is situated south of the line Charleroi-Namur-Liége as well as for the surroundings of Brussels. This very carefully and comprehensively drawn memorandum is supplemented by a map showing the landing places. It bears the inscription "Secret" and is dated July, 1914. These military geographical handbooks cannot be supposed to have been written shortly before or during the war. That would, aside from putting them in print, have been impossible. The material for the work has, on the contrary, as may be seen from remarks in the different parts, been collected since 1909. The first volume was printed in 1912. The manuals therefore prove a minute preparation carried on during the last five years for an English campaign in neutral Belgium. They are nothing else but secret regulations of military service for an English army fighting in Belgium. The English general staff therefore since long time prepared themselves for this event and foresaw the same so surely that they undertook the painstaking work of compiling these military handbooks. Without ready and far-reaching assistance on the part of the Belgian government and military authorities such at work would not have been possible. Those strategical and tactical reports, going into the minutest details, as mentioned above, or such exact data concerning railroads and transportation service, rolling stock, locks, and bridges, could not have been obtained in any other way. The schedules about the billeting capacity, which deal with Belgium as if it were English territory, could only be derived from the Belgian government. Without doubt official Belgium material has been used. It is made suitable for English purposes or at many places simply translated into English! Very extensively, indeed, England and Belgium had prepared themselves together during times of peace for military co-operation. Belgium in political as well as in military matters was nothing but a vassal state of England. The indignation which England today is putting tip before the world because of Germany's so-called breach of neutrality is made altogether meaningless and unjust by those documents. When on account of our operations at the coast the English and French press remarked sneeringly that we were not sufficiently instructed about the dangers of the inundation district in the so-called "Polderland" they were right in so far as before the beginning of the war we did not know Belgian territorial conditions any better than may be learned from sources obtainable in the book market. The English reconnoitering reports and the excellent maps, therefore, were very valuable booty for us. We were able to make immediate use of this remarkable material and thus could fight England with her own weapons. That should be the best indication of the importance of our enemies' painstaking labor. New and convincing evidence with reference to the Anglo-Belgian complicity has been found. Some time ago there was detained in Brussels the British Secretary of Legation, Grant-Watson, who had remained in the British Legation after the office had been transferred to Antwerp and later on to Havre. This Grant-Watson has been caught in the act of disposing of a number of documents which he at the time of his detention had taken with him from the Legation. An investigation of these documents showed that they were of the most intimate kind, containing exact information, of the years 1913 and 1914, about the Belgian mobilization plans and about the defense of Antwerp. 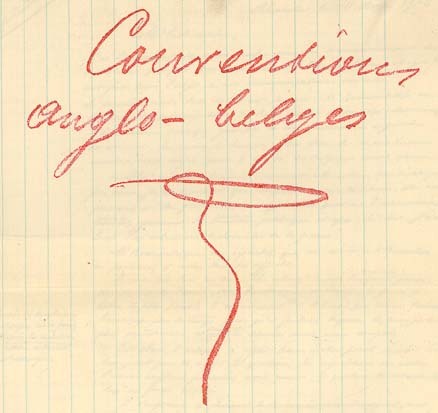 Among them were also found circular decrees directed to the higher Belgian commands, with fac-simile signatures of the Belgian Minister of War and the Belgian General Staff. Furthermore, a report of a session of the "commission for the provisions base at Antwerp" of May 27, 1913, was found. The fact that these documents had been at the British Legation sufficiently proves that the Belgian Government in military matters had no secrets from the British Government and that those two governments had a continuous and most intimate understanding in military matters. (1) Les officiers français ont reçu ordre de rejoindre dès le 27, après-midi. (2) Le même jour le chef de Gare de Feignies a reçu ordre de concentrer vers Maubeuge tous les wagons fermés disponibles en vue de transport de troupes. Communiqué par la Brigade de gendarmerie de Frameries. (1) The French officers have received order to rejoin on the 27th in the afternoon. (2) The same day the station master at Feignies has received order to concentrate toward Maubeuge all available closed railway cars in view of transport of troops. Communicated by the brigade de gendarmerie at Frameries. It is of interest to note that Feignies is a railway station on the Maubeuge-Mons line, about three kilometers from the Franco-Belgian boundary. From this note we learn that France as early as July 27 had taken her first mobilization measures and that the English Legation received notice of this fact immediately from the Belgian Government. If there were any need for further proof of the relations which existed between England and Belgium the material found would be a valuable supplement in that respect. It shows again that Belgium had abandoned her neutrality in favor of the entente and that she had become an active member of that coalition, which was formed for the purpose of fighting Germany. For England, however, Belgian neutrality meant nothing more than a "scrap of paper," which she appealed to if it were advantageous to her interests and which she ignored if this were more to her purposes. It is plain that the English Government used the violation of Belgian neutrality by Germany as a pretext only in order to make the world and the English people believe that her cause for the war was a just one. Belgium's neutrality which England pretended to be shielding is nothing but a mask. On August 2, at 7 P. m., we informed Brussels that France's plan of campaign, known to us, compelled us, for reasons of self-preservation, to march through Belgium. But the same afternoon already, that is to say before anything of that démarche was known and could be known at London, the British Government had pledged its support to France, pledged it unconditionally in case the German fleet attacked the French coast. Not one word was then said of Belgium's neutrality. This fact is established by the declaration of Sir Edward Grey in the House of Commons on August 3, which, owing to the difficulties in the transmission of telegrams prevailing at that time, was not known to me in full on August 4---and it is confirmed by the Blue Book, issued by the British Government. How then can England pretend that she drew the sword because we violated Belgium's neutrality? How could British statesmen, who accurately knew the past, talk of Belgian neutrality at all? When on August 4, 1 referred to the wrong we were doing in marching through Belgium it was not yet known for certain whether in the hour of affliction the Brussels Government would not decide after all to spare the country and to retire to Antwerp under protest. Remembering that, after the occupation of Liége, I addressed renewed offers in that sense to the Belgian Government, at the request of our Army Administration, you will understand that, on August 4, for military reasons, the possibility for such a development had to be kept open under all circumstances. Even then the guilt of the Belgian Government was apparent from many a sign. I had not yet any positive documentary proofs thereof at my disposal, but the British statesmen were perfectly familiar with those proofs. The documents which, in the meantime, have been found at Brussels, and which have been given publicity by me, prove and establish in what way and to what degree Belgium had surrendered her neutrality to England. The whole world is now acquainted with two outstanding facts---first, when, in the night from the 3d to the 4th of August, our troops entered Belgium, they were not on neutral soil, but on the soil of a state that had long abandoned its neutrality; second, England has declared war on us, not for the sake of Belgium's neutrality, which she herself had helped to undermine, but because she believed that, with the co-operation of two great military Powers of the Continent, she could overcome and master us. Ever since August 2, when she promised armed support to France, England was no longer neutral but actually in a state of war with us. Her pointing at our violation of Belgium's neutrality, when she declared war on us on August 4, was nothing but a spectacular trick, intended to deceive the English people and foreign neutral countries about her true war motives. The war plans which England and Belgium had worked out together to the minutest details now being unveiled, the policy of British statesmen is branded in world history, for all time to come! "Together with two other hussars I was out on patrol. While these two probably fell, I, losing my horse, succeeded in getting away, hurried to the next village, where I changed my clothes in a house. Thus I was captured alone and can give no information as to the whereabouts of other comrades. "Upon being asked, the aforementioned stated that his regiment was mobilized on July 30, 1914. The regiment left its garrison on July 31st and was detrained at midnight in Hirson. In the same night the regiment rode to Laneuville-aux-Tourneurs, where it remained two days. From there it then proceeded to Donchery, and on August 2nd from there to Bouillon. At Bouillon they united with the dragoon regiments 23 and 27, also with the 3d regiment of Hussars. These regiments are said to have crossed the frontier simultaneously." "The 21st French regiment of dragoons was transported by rail from Noyon, its garrison, to Hirson in one day, and on the same day the regiment took quarters in villages in the vicinity of Hirson; the second squadron, to which I belong, at Bossus. The second squadron remained several days at Bossus. On the evening of the latter day, about between six and seven o'clock, I was in Bossus in the place of a hairdresser, who sold tobacco and had a taproom. In the room in which I sat during this time a bell rang. The hairdresser stepped to the telephone; someone spoke to him. When he hung up the receiver he called out to me that he had received per telephone, just now, the news that just then in France the mobilization had been ordered. I know positively that the second squadron left Bossus early the next morning and soon thereafter joined the other squadrons. The regiment made a day's march to the Belgian city Bouillon, near which the Belgian-French border was crossed. Simultaneously with the 21st also the 5th French regiment of dragoons, and also one or several French regiments of cuirassiers which I saw, but the number of which I do not know, together with artillery, the regimental number of which I also do not know, crossed the Franco-Belgian frontier in the direction of Bouillon. Bouillon, therefore, was reached on the same day on the morning of which the 21st regiment of dragoons had ridden out of Bossus and the villages in the vicinity. The 21st regiment of dragoons rode through Bouillon and spent the night in the immediate vicinity, the second squadron in a small church village, a few kilometers distant. On the next morning the 21st and 5th regiments of dragoons, forming a brigade, rode northward deeper into Belgium. There also were French cavalry regiments, especially cuirassiers and artillery, which I am not able to specify more minutely." "On July 31, 1914, at 10 a. m., the two regiments of dragoons, the 28th and the 30th, garrisoned at Sedan, proceeded into the field. At first they rode together in France, along the State Street to Mouzon, where they arrived about noon. In the hours of the afternoon, about between 2 and 2:30, there arrived from a different direction, in the village of Mouzon, four cannon of the 40th French artillery regiment, garrisoned in Meziers-Charleville, together. with munition wagons, whereupon the two regiments of dragoons, the 28th in the lead, then the guns, and following them the 30th regiment of dragoons, started out, at first again in the direction towards Sedan. "The dragoons rode four abreast, without guards; the 3d troop of the 3d squadron, to which I belonged, rode furthest in advance. I rode in the fourth file, and therefore was able to see everything that transpired at the head of the detachment. "When the detachment had arrived near the French village of Bazeilles, on the State highroad Mouzon-Sedan, it suddenly turned towards the North and proceeded via La Chapelle to the Belgian frontier. The Belgian-French frontier was crossed on July 31, 1914, at about 9 o'clock in the evening, or a few quarters of an hour thereafter, on the highroad La Chapelle-Bouillon, by the two French regiments of dragoons and the French battery. Lieutenant Malespieux, commanding my troop, rode at the head. On the spot where the highroad La Chapelle-Bouillon crosses the French border, a Belgian brigadier and four gendarmes on horse, who as such were without difficulty recognizable by their uniforms, reported to him. The brigadier and the four gendarmes were waiting already at this point when we arrived there. These five members of the gendarmerie then proceeded at the head and thus led the detachment to the city of Bouillon, located three miles from the French border on Belgian soil. A short distance before Bouillon, the 30th regiment of dragoons, separated from the detachment in order to take quarters on Belgian territory, so that only the 28th regiment of dragoons and the battery entered Bouillon on July 31, 1914, about 10 o'clock in the evening. The head of the regiment stopped in the city before the office of the burgomaster. Captain Lainez, commanding my squadron, entered the building. After some time---it may have been an hour---a municipal functionary brought from the burgomaster's office the quarter notices for the 28th regiment of dragoons and the battery, which was still standing in the street before the burgomaster's office. I then proceeded with about thirty other dragoons to my quarters, a barn within the city. "The night from July 31, 194, to August 1, 1914, therefore was spent by the 28th French regiment of dragoons and the French battery in the Belgian city of Bouillon, while the 30th regiment of dragoons also was lying in quarters on Belgian soil nearby. The reception on the part of the Belgian population was in no way antagonistic, but on the contrary, very friendly. "After the morning inspection, Lieutenant Malespieux, together with twenty-five dragoons, I among them, left, as a patrol, in an easterly direction, before six o'clock in the morning, alternately walking the horses, then in a trot, we proceeded along the highroad from Bouillon to Arlon, towards the east, constantly on Belgian soil. The ride of this patrol led from Bouillon on this road through the Belgian municipalities: St. Cécile, Chassepierre, Florenville, Pin, Vincent, Belle Fontaine, St. Marie to St. Laurent, which lies toward Arlon and is more than forty kilometers distant from Bouillon. Therefore, on August 1, 1914, more than forty kilometers were covered in an easterly direction, exclusively on Belgian soil. The officers' patrol, twenty-five men, arrived at St. Laurent after nine o'clock in the evening. Lieutenant Malespieux rode according to the map; on the way he did not send out any smaller patrols. About an hour later, the entire regiment of the 28th dragoons and the French battery arrived in St. Laurent The men stated that they had followed on the same road along which the patrol had proceeded. They had ridden together with the 30th regiment of dragoons and the French battery up to within a short distance of St. Laurent, in the neighborhood of which the 30th regiment of dragoons separated from the rest of the column and proceeded to a Belgian village situated a few kilometers distant from St. Laurent. The two regiments of dragoons and the battery therefore proceeded on August 1, 1914, more than forty kilometers, advancing into Belgian territory. "When I, on August 1st, together with the officers' patrol of twenty-five men, riding along the State highroad Bouillon-Arlon, this patrol, in the section Bouillon-Florenville, passed a country road which crosses the highroad Bouillon-Florenville and the open field. According to my recollection, about 500 meters behind this crossing, there is a village through which we rode, situated about three kilometers from Florenville. To the right of the highroad, three French cavalry regiments were standing as we were passing this crossing point of the two roads. The men called out to us that they were the Third and Sixth Cuirassiers, and the French 4th regiment of hussars. As we passed, the three French cavalry regiments set also in motion and followed the patrol for several hours. A considerable number of kilometers, it may have been ten, after riding through Florenville, the three cavalry regiments, which we had met in probably the earlier hours of the afternoon of August 1, 1914, at the road-crossing on Belgian soil, and which had followed us for several hours, turned to the left, and therefore entered still more deeply into Belgium. "On about July 20, 1914, 1 had entered a request for a fourteen days' furlough to my home, Rimonge, and this had been granted and was to begin on August 1, 1914. Even in the evening of July 30, 1914, nothing was known of the mobilization, and I was of the opinion that on August 1, 1914, 1 would be able to go home for a fortnight. The physical inspection, to which every French soldier must submit before he goes on furlough, had been ordered for me the morning of July 31, 1914. Instead of meeting the physician on July 31, 1914, and going on furlough on August 1, I was obliged on July 31, 194, to suddenly proceed to the field. That has impressed itself on my memory indelibly. I repeat that every error as to my mentioning of time and dates is out of the question." In the records of political hypocrisy we doubt if there is anything more complete or more dishonest than that of the British Tory Party, regarding Belgium, and we give today a proof which must make honest men stand aghast and fill decent citizens with disgust. On February 4, 1887, The Standard published a letter and leading article, both of which we reproduce below. At that time The Standard was the official organ of the Tory Government; its editor was a bosom friend of Lord Salisbury, and every pronouncement of this character which appeared in it was to all intents and purposes a Government statement. It will be noted that in the leading article "Diplomaticus" is described as being a person of high authority, and his letter has been regarded as official by writers on diplomatic history like M. Milovanovitch. (Traités de Garantie au XIX Siècle, Paris (1888), p. 465). Sir:---Military experts are of the opinion that France has spent so much money, and spent it so well during the last sixteen years in providing herself with a fresh military frontier, that a direct advance by the German armies into France, past the new fortresses and forts that have been erected and linked together, would be, even if possible, a very hazardous undertaking. But if Germany was, or considered itself to be, provoked into a struggle of life and death with France would Prince Bismarck, with the mighty forces he can set in motion, consent to be baffled by the artificial obstacles to which I have alluded, so long as there existed a natural and undefended road by which he could escape from his embarrassment? Such a road or way out does exist. It lies on Belgian territory. But the neutrality of Belgium is protected by European guarantee and England is one of the guarantors. In 1870 Earl Granville, then at the head of the English Foreign Office, alive to this danger, promptly and wisely bound England to side with France if Prussia violated Belgian territory and with Prussia if France did so. Would Lord Salisbury act prudently to take upon himself a similar engagement in the event of a fresh conflict between these two countries? It is for Englishmen to answer the question. But it seems to me, as one not indifferent to the interests and greatness of England, that such a course at the present moment would be unwise to the last degree. However much England might regret the invasion of Belgian territory by either party to the struggle, she could not take part with France against Germany (even if Germany were to seek to turn the French flank by putting its armies through the Belgian Ardennes) without utterly vitiating and destroying the main purpose of English policy all over the world. But, it will be asked, must not England honor its signature and be faithful to its public pledges? I reply that your Foreign Minister ought to be equal to the task of meeting this objection without committing England to war. The temporary use of a right of way is something different from a permanent and wrongful possession of territory; and surely England would be easily able to obtain from Prince Bismarck ample and adequate guarantees that, at the close of the conflict, the territory of Belgium should remain intact as before? You will see, sir, that I raise, in a very few words, an exceedingly important question. It is for the English people to perpend and pronounce. But it is high time they reflected on it. I am, sir, your obedient servant, "DIPLOMATICUS." We are reminded this morning, by a correspondent who speaks with high authority, that while we are all wondering how long it will be before a fresh conflict breaks out between France and Germany, Englishmen are shutting their eyes to a question closely, and perhaps inevitably, allied with that contingent event, and affecting the interests of this country more vitally than they could be affected even by any probable result from the struggle between those two powerful States. In the event of war between Germany and France, and in case either Germany or France were to disregard the neutrality of Belgian territory, what ought England to do? That is the question and he indicates pretty plainly a reply with which, we may at once say, we do not believe the English people will be disposed to quarrel. In order, however, to enable them to respond to the inquiry with full knowledge and deliberate judgment, it is necessary to lay before them the facts and the contingencies of the situation somewhat more amply and more in extenso than is done by "Diplomaticus." On the declaration of war by France against Prussia in 1870, Earl Granville, as we all know, with more promptness and decision than be usually displayed, sought to secure respect for Belgian territory by notifying that, should either combatant ignore the neutrality secured to it by public treaty, England would side actively with the other combatant. It may be said, why cannot the same course be pursued once more in the event of a similar condition of affairs coming into play? The answer is that a similar condition of affairs no longer exists. In the first place, in 1870 neither of the combatants had any pressing necessity to resort to a violation of Belgian territory in the execution of their military designs. ---that no precautions had been taken against the possibility of France being invaded. . . . Metz and Strassburg are now German fortresses; and no one requires to be told that Germany has neglected no precautions or expedients to render the invasion of the territory of the Fatherland a difficult if not an impracticable undertaking. Armed to the head for offense, Germany is likewise armed to the heel for defense. She is more invulnerable than Achilles, for there is no point uncovered. How stands it with France as regards defense against invasion? . . . Not only does France possess a first line of fortresses, contiguous to German territory, in Belfort, Epinal, Toul, and Verdun, but all four are linked with each other in succession by another line of detached forts . . . a direct advance by the German armies into France by the new fortresses and forts that have been erected and linked together would be, even if possible, a very hazardous undertaking. There are, however, two other ways of entering France from Germany. One is through Switzerland, the other is through Belgium. Both are what is understood by "neutral territory," but the mountainous character of Switzerland renders access to France through its passes more arduous and less accessible than through the territory of Belgium. In case the German armies found themselves practically prevented from engaging in offensive military operations against France by the admirable line of defense with which she has provided herself, would Prince Bismarck and the great soldiers whom he would inspire consent to be thwarted by the inviolability of Belgium as guaranteed by European treaty? "Diplomaticus" puts the question with undiplomatic bluntness. He forbears from answering it, and so must we. But it will be obvious to everybody that there is a possibility, a danger, of Germany not being willing to be debarred from invading France by an obstacle that has grown up since the treaty guaranteeing the neutrality of Belgium was signed. Our readers will at once perceive that the situation is absolutely different from the one that existed in 1870 when Earl Granville quickly and cheerfully imposed on England the obligation to take part against either combatant that violated Belgian soil. Neither combatant was much tempted to do so, and thus the engagement assumed by England---a very proper one at the time---was not very serious or onerous and saved appearances rather than created responsibility. Now the situation is entirely changed. If England, with a view to securing respect for Belgian territory, were to bind itself, as in 1870, to throw its weight into the balance against either France or Germany, should either France or Germany violate Belgian ground, we might, and probably should, find ourselves involved in a war of giants on our own account. We think that "Diplomaticus" understands the English people when he hints his suspicion that such a result would be utterly alien alike to their wishes and to their interests. For over and above the fact that, as we have seen, the temptation to violate Belgian territory by either side is much greater than it was in 1870, the relations of England with European Powers have necessarily and naturally undergone considerable modification during that period. We concur with our correspondent in the opinion he expresses that for England and Germany to quarrel, it matters not upon what subject, would be highly injurious to the interests of both. Indeed, he is right when he says that the main outlines of our policy would be blurred and its main purposes embarrassed, if not defeated, were we suddenly to find ourselves in a state of hostility to Germany instead of one of friendliness and sympathy. No doubt if Germany were to outrage the honor or disregard the interests of England we should be ready enough to accept the challenge thrown down to us. But would the violation of Belgian territory, whether by Germany or France, be such an injury to our honor and such a blow to our interests? It might be so in certain circumstances and it would assuredly be so if it involved a permanent violation of the independence of Belgium. But, as "Diplomaticus" ingeniously suggests, there is all the difference in the world between the momentary use of a "right of way," even if the use of the right of way be, in a sense, wrongful, and the appropriation of the ground covered by the right of way. We trust that both Germany and France would refrain even from this minor trespass. But if they did not? If one or the other were to say to England, "All the military approaches to France and Germany have been closed, and only neutral approaches lie open to us. This state of things is not only detrimental but fatal to our military success, and it has arisen since the treaty guaranteed the sacredness of the only roads of which we can now avail ourselves. We will, as a fact, respect the independence of Belgium, and we will give you the most solemn and binding guarantees that at the end of the conflict Belgium shall be as free and independent as before," if Germany (and of course our hypothesis applies also to France) were to use this language---though we trust there will be no occasion for it---we cannot doubt what would be the wise and proper course for England to pursue, and what would be the answer of the English Government. England does not wish to shirk its true responsibilities. But it would be madness for us to incur or to assume responsibilities unnecessarily when to do so would manifestly involve our participation in a tremendous war.
. . . the general idea is that England will be kept out of this war. . . . That she will try to do so we do not doubt, but there is the Belgian difficulty ahead. Our guarantee for her is not a solitary one, and would not bind us to fight alone; but there are general interests to be considered. The probability is that we shall insist on her not becoming a theatre of war but shall not bar---as indeed we cannot bar---the traversing of her soil. We think that these documents prove the grave statements by which we introduced them. Are we bound to intervene? The Standard this morning gives special prominence to a letter signed "Diplomaticus" on the neutrality of Belgium. It also devotes its first leading article to the subject. The gist of these utterances may be summed up in two propositions: (1) England is under a treaty of obligation to defend the neutrality of Belgium; (2) But circumstances have altered since the contraction of the said obligation, and as against Germany, at any rate, England must pocket its pledges, and allow France to be invaded through Belgium without protesting or interfering. Considerable importance is likely to be attributed to these conclusions abroad owing to its being understood that The Standard is at present the Governmental Salisburian organ. Each of the propositions laid down by our contemporary is, it will be seen, likely to be taken hold of. Germany. might read the second as an invitation to invade France through Belgium; France might read the first as an admission of our obligation to prevent, or rather to punish, such an infringement of neutral territory, if we dared. It becomes important, therefore, to point out that The Standard's argument rests on a false assumption. We do not for the present argue whether in the contingencies contemplated it would be England's interest to intervene by declaring war against whichever belligerent might violate the neutrality of Belgium; we confine ourselves to the preliminary statement essential for clearing up the case---that it is not England's obligation to do so. "Her Majesty the Queen of the United Kingdom of Great Britain and Ireland declares that if during the said hostilities the armies of France (or Prussia) should violate the neutrality of Belgium, she will be prepared to co-operate with his Prussian Majesty (or the Emperor of the French) for the defense of the same in such a manner as may be mutually agreed upon, employing for that purpose her naval and military forces to ensure its observance." "The independence and neutrality of Belgium will, so far as the High Contracting Parties are respectively concerned, continue to rest as heretofore on the first article of the Quintuple Treaty of the 19th of April, 1839." Now, what some people do is to read this treaty of 1839 by the light of the more specific treaty of 1870, and to deduce from the former the same obligation on the part of England to intervene against any infringement of Belgium's neutrality as was contained in the 1870 treaty. "His Majesty the Emperor of Austria, King of Hungary and Bohemia, His Majesty the King of the French, Her Majesty the Queen of the United Kingdom of Great Britain and Ireland, His Majesty the King of Prussia, and His Majesty the Emperor of all the Russias, declare that the articles hereby annexed to the treaty concluded this day between His Majesty the King of the Belgians and His Majesty the King of the Netherlands, Grand Duke of Luxembourg, are considered as having the same force and value as if they were textually inserted in the present act, and that they are thus placed under the guarantee of their Majesties." "Belgium will form, within the limits indicated in 1, 2, and 4, an independent and perpetually neutral State. She will be bound to observe this same neutrality toward all other States." In this treaty it will be seen there is nothing about any guarantee; all that can be elicited from it, and from the one cited as referring to it, is this, that this clause is placed under the guarantee of "their said Majesties," that is, England, Austria, France, Germany and Russia. But that is not all. This constructive guarantee must be considered in relation to the party to whom it was given---namely to the Netherlands. For the treaty of 1839 was one between the five Powers on the one hand and the Netherlands on the other; and what the five Powers did was to guarantee to the Netherlands the treaty contracted between it and Belgium, one clause of which treaty said that Belgium should form, "an independent and perpetually neutral State" and should "be bound to observe such neutrality toward all other States." In the treaty of 1831, it is true, there was a further article guaranteeing the execution of all preceding articles (including, therefore, the one just cited in similar terms from the 1839 treaty) to the King of the Belgians, but in the 1839 treaty, on which the independence of Belgian is now said to rest, Lord Palmerston omitted any such guarantee. There is, therefore, no English guarantee to Belgium. It is possible, perhaps, to "construct such a guarantee; but the case may be summed up as follows: (1) England is under no guarantee whatever except such as is common to Austria, France, Russia, and Germany; (2) that guarantee is not specifically of the neutrality of Belgium at all; and (3) is given not to Belgium but to the Netherlands. Pall Mall Gazette, February 5, 1887 OCCASIONAL NOTES. The attempt of the Morning Post to prove that this country is under a guarantee to Belgium to defend its neutrality is highly unsuccessful. "The treaty of the 15th of November, 1831," it says, "was cancelled by treaties of the 19th of April, 1839, but the provisions regarding the neutrality of Belgium remained intact." This, as we pointed out yesterday, is not the case. The treaty of 1831 was with Belgium, and the execution of its articles (including one which provided for the neutrality of Belgium) was guaranteed to the King of the Belgians. But in the treaty of 1839, though the article asserting the neutrality of Belgium remains, the guarantee disappears. It is the more surprising that the Morning Post should be at such pains to prove that there is still a guarantee, since the only action it would in any case recommend being taken on it is a platonic protest. To construe a non-existent guarantee in order to have the privilege of uttering an unavailing protest is surely the very superfluity of futility. But the line taken by the Morning Post is perhaps not quite so absurd as that which The Standard yesterday suggested, and a correspondent repeats this morning. We are to construct the guarantee and are then to declare our obligation to defend the neutrality of Belgium against all comers. But when any particular comer infringes that neutrality we are to grant him a special dispensation. The Standard and its correspondent speak only of giving this dispensation to Germany; what is to be allowed to Germany could not be denied to France. Our defense of the neutrality of Belgium would thus be never today but always every other day; it would be asserted against anyone in general, but withdrawn against anyone in particular. With such absurdities staring them in the face, it is surprising that our contemporaries do not take the trouble to ascertain that the guarantee which they are so ingeniously but unheroically whittling down does not in fact exist at all. We wonder if national honour was held in less esteem in 1887 than in 1914. That cannot be the explanation of these articles and of the professions of Liberal and Tory politicians at the present moment. We have a shrewd suspicion that the real explanation is that in the minds of these politicians national honour is merely an affair of party convenience, that "circumstances" caused our diplomatists in 1887 to take one view, whereas in 1914 they caused the same gentlemen to take another view. The unsophisticated man in the street is steady all the time. He has an instinctive sense of what is right and what is wrong, and we shall have neither consistency nor honour in foreign politics until means are adopted which will enable him to control them. He is now a mere victim in the hands of Foreign Offices which muddle their business and the power to involve his life and his honour in whatever they say or do. This page was last modified on 28 May 2009, at 17:17.